For marketers who use Twitter, video ads are still one of the brightest features to employ to get the word out about products and services. Since their introduction in 2012 in the form of Twitter cards, video ads have been quite important to businesses that prefer outreach using audio and visual cues to attract customers. Industry consensus aligns with common sense: video ads will continue to flourish in the coming years, as video is the prime medium for brands and the most powerful visual tool in their marketing arsenal. Below is the definitive guide to generating leads with Twitter video ads. We will go over the advantages of using ads, what kinds of content work best on the Twitter platform, and how to upload and manage the video content. Why Do You Need to Use Twitter Video Ads? Before an advertiser begins the process of using a new marketing channel, it is always best to know exactly why that marketing channel is useful. Here are just a few of the reasons Twitter video ads are a great investment for nearly every industry. Video views on Twitter have grown by a factor of 220X in 12 months. Ever since Twitter introduced video ads, they have been taking market share from other video platforms, including YouTube, Facebook, and Instagram. Twitter is a mobile-first platform that speaks to the current generation of buyers. 93% of Twitter views come from mobile devices. Twitter users are savvy and loyal. The mobile-first audience is also an audience of early adopters (53%), leaders in their social circles (64%), and young and affluent (80%). They are also highly loyal to brands they find useful, being 9% more attentive, 9% more responsive, and 10% more trusting than viewers from other social media sites. What Types of Twitter Videos Work Best for Lead Generation? Advertising on Twitter can help you reach different goals, such as raise brand awareness, grow a follower base, and of course generate and capture leads. If the most important purpose of placing your ads on Twitter is lead generation, here is a breakdown of the different types of videos you may use in your ads and the ways they affect lead generation. Video normally works better than GIFs overall when drawing the eye of new customers. However, the GIF is more cost effective, easier to create, and gives you the ability to whet your audience’s appetite for your major video creations. GIFs also have the potential to go viral. There is a subculture that goes along with GIFs that videos do not have – this subculture has migrated from sites like Giphy to Twitter when the latter introduced a built-in GIF library in 2016. One of the best examples of how top marketers catch the attention of their audiences with GIF is Hootsuite. Recently the company started posting funny GIFs featuring Owly, their mascot, on Twitter. Not only has this let them amplify their brand identity on social, but also allowed for a more personalized approach. The library of the branded Owly GIFs can be found on giphy.com/hootsuite. Native video is perhaps the easiest type of video to upload. If you have a killer idea that you believe will stand on its own artistic merit, then you may be able to simply record a native video and upload it to your Twitter account. Native video works quite well for unexpected behind-the-scenes content that showcases something genuine about your business. These types of videos do not require as much production value because they are so authentic. Follow the instructions below in the section marked “How to Record/Upload Videos and GIFs to Twitter” to create native video from the iOS or Android operating systems. Video series is a great way to keep new audiences coming back for more. This is not viewing a single ad, but rather a story that introduces a concept that is not resolved until a future video is produced. If this is well done, you will have prospects coming back to your page so that they can view another portion of the storyline. In the meantime, you have introduced them to your products and services multiple times during the arc of the story over many videos. The video series is also a great way to create a pull marketing strategy that does not seem like a hard sell. Indirect marketing techniques are much more effective with the millennial audience that populates Twitter. This audience is also moving away from television, radio, and traditional media looking for new, original content. A video series may be the perfect way to draw them in and advertise your products to them. HomeStars has analyzed its top-performing blog posts and repurposed them into a series of household tips and tricks videos which were published on Twitter. Later, the team compared the performance of the Twitter videos and the blog post links that the videos originated from. For example, Twitter impressions of the Door Color video below increased by 105% compared to the blog post, clicks/views grew by 8,900%, and Twitter engagements by 733%. Live video is one of the most effective tools that you can use on Twitter to generate leads. Twitter is fast gaining a reputation as a site for live content. This content is scarce, authentic, and personal – just the type of material that the millennial audience on Twitter is looking for. Google Local Guides is a great example of a brand tailoring their content for the audience. It extensively uses Twitter live videos to introduce local destinations, customs, and people, and humanize their brand at the same time. 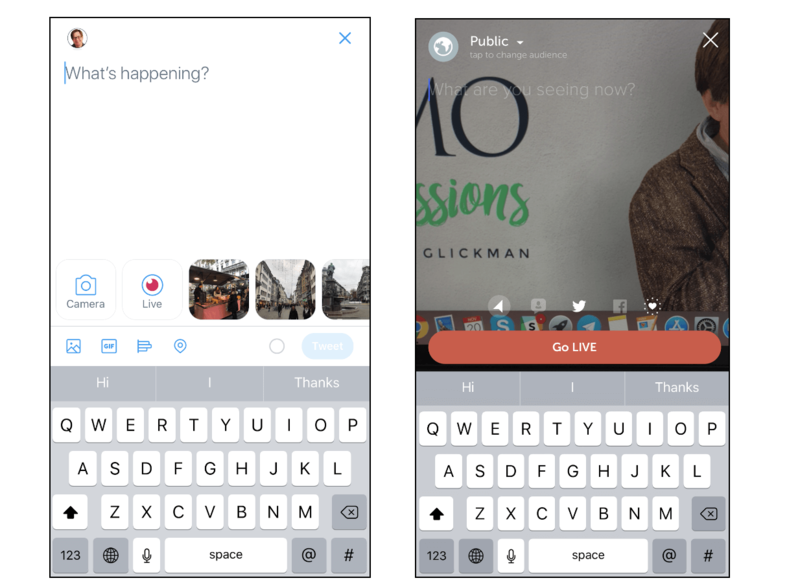 Twitter distributes live video through the Periscope tool. It’s built-in, so no need to download and install the Periscope app itself. Organizations and personalities, large and small, use this tool to create videos that share information and generate content within which pull marketing techniques are highly effective. Tap once on the “Tweet” icon, which looks like a feather with a plus sign to the left of it. Tap once on the red “Live” video icon. On the next screen, tap on the “Go Live” big button. When you are ready to end your live video, simply swipe down on your screen and hit the “End Video” button. Note: Live broadcasts are only enabled on iOS and Android Twitter apps, not desktop. Twitter promotes live videos on a different search timeline than its other content, meaning that you have a higher chance of being found by new leads. 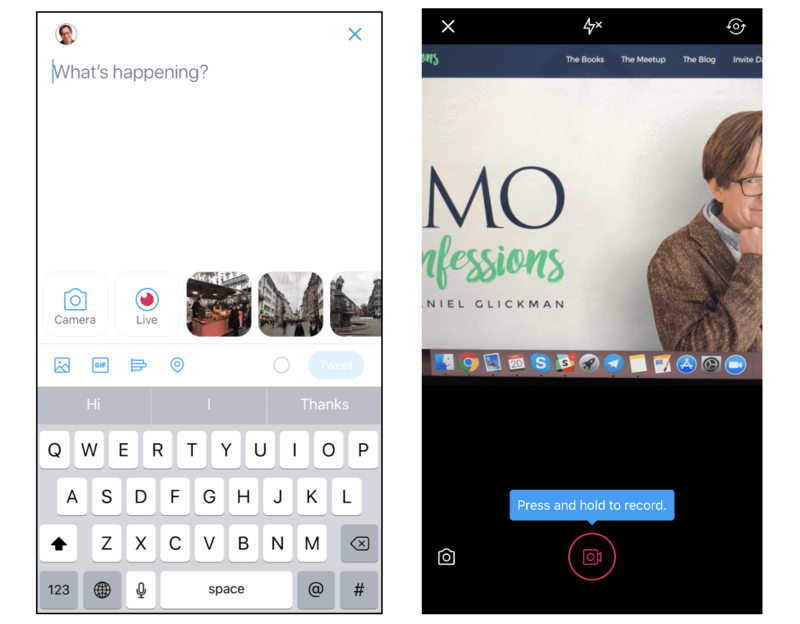 You can embed your live video content inside tweets just like pictures and regular videos. You can add a location for your live video to direct your marketing even more precisely. Your content is also searchable on Periscope, and if you set a location, you can be found on the Periscope Global Map. Saving your live video is also a great way to capture content that can be edited later and used within produced video content. Live video can generate a great deal of real-time attention for a product. Try to find and connect your brand to things that are immediately relevant in pop culture. If you have an inside angle on any information because of your expertise or location (see the Google Local Guides example), you will likely receive more attention. Live video allows for comments as well, so you may want to have an employee ready to respond to the chat stream as your live video is moving. Twitter live video also has the capacity for 360-degree cameras, giving your audience an even more immersive experience. You may want to invest in 360-degree cameras if you plan on going live often as a tool for business. Note: Keep in mind that you cannot go live on Twitter if you have enabled protected tweets. Not all content needs to be fully produced and complete in order to work, especially on Twitter. The teaser can be just as effective as the video series as long as the content in total is properly managed. New prospects may not be invested in your brand deeply enough to view an entire video series, especially if your brand is new to the marketplace. One of the best ways to introduce yourself to a new audience without seeming to oversell is through a short teaser. Teasers that are well produced and engaging also have the opportunity to go viral. Once people in your target audience see that there is more to come, they may come to your Twitter page and earmark your sites for future reference. 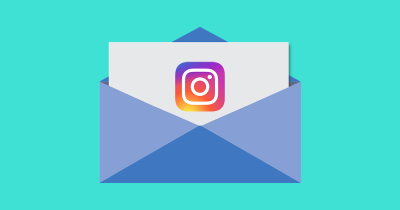 From here, you can engage them through future ads, indirect marketing, and notifications to draw them into a larger marketing arc. Younger TV uses short, titillating 15-second video clips of their show to bring in the viewers. Underneath the clip, they have the time and channel for the show along with blurbs about the creators. How Exactly Do You Generate Leads on Twitter? Speaking of leads, it makes sense to first define what a lead is since this will affect your selection of the Twitter ad campaigns. A sales lead is a potential customer (an individual or business) that expresses interest in your product/service and provides contact information. “Provides contact information” is probably the most important part of the definition that allows designating someone as a lead. The leads should be given instruments (normally a landing page) to provide you with their contact information. So the ultimate goal of Twitter ads in terms of lead generation would be to drive people to your website or landing page. Twitter offers a few different advertising campaigns which are accessible in the Twitter Ads Manager. What Is the Twitter Ads Manager? The Twitter Ads Manager is a place that consolidates all the tools that a marketer needs in order to properly advertise a business on Twitter. From this central location, you can manage, plan, and generate reports on your ads. 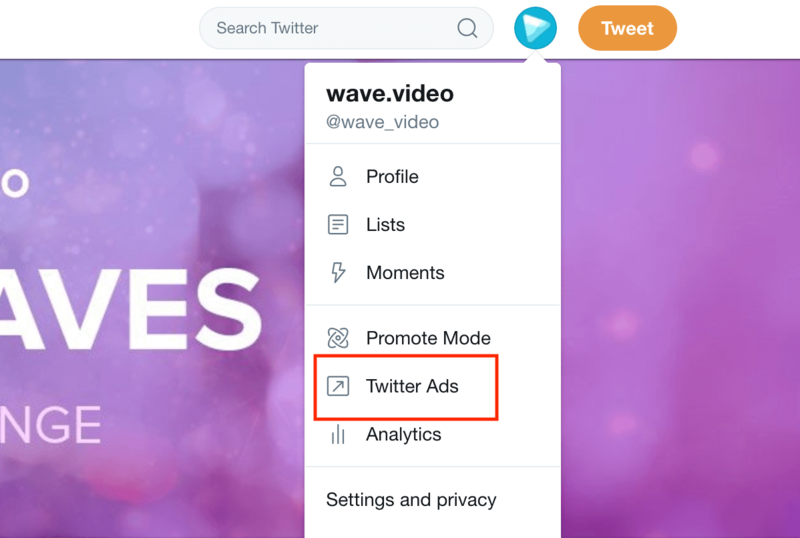 Advertisers can run entire campaigns from the Twitter Ads Manager, including promoted tweets, ad groups, and single ads. The Twitter Ads Manager can be found in your Account Settings -> Twitter Ads. How Does the Twitter Ads Manager Work? 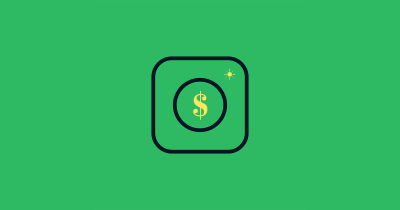 The Ads Manager has custom filters that allow an advertiser to evaluate selected ads based on status, objective, the campaign name, or the funding source. You can add as many filters as you want to narrow the types of ads that you manage at any one time – simply click the “Add Filter” button. Once you have your campaign filters in place, you can save the setup for later use. These filter sets may be used over and over again, and you do not have to remember them when you use the Twitter Ads Manager. You can save many filter sets. The Ads Manager also has metrics that you can customize. By default, you will see Result Rate, Cost Per Result, and All Results on your screen. You can present every metric by an objective by simply clicking that objective in your Metrics Summary drop-down menu. This option replaces the clunkier dashboard that used to serve as the platform for metrics. You can search for the metrics that you have customized by name, add and remove metrics, and change the order of metrics on your screen through the simple drag and drop mechanism that Twitter has perfected. Once you have saved your metric sets, you can bring them back at any time by finding the customized name in your metrics drop-down menu. You can also share a view that you have created by clicking the button that is just to the right of the export feature, “Share.” Anyone with access to your account will be able to see the customized view that you have generated. 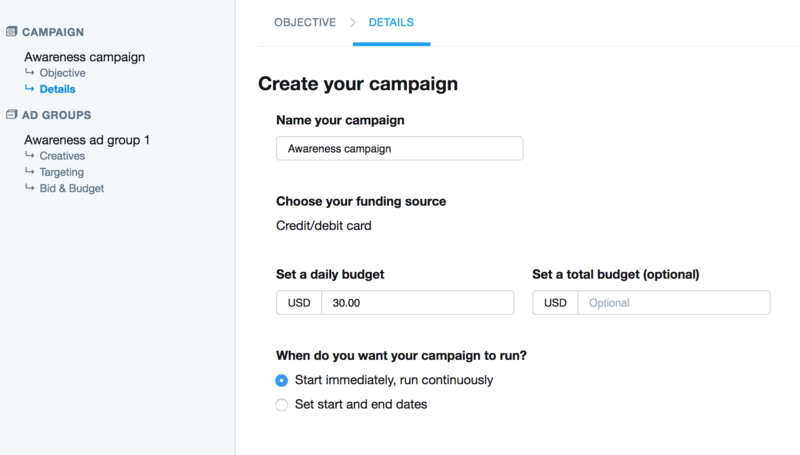 To create a Twitter advertising campaign, click the “Create Campaign” button in the upper right corner of the screen in the Twitter Ads Manager. You will be forwarded to the Campaign Creator to schedule your ads. If your goal is to drive leads to your website, your first choice would be a “Website Clicks or Conversions” campaign. However, I’d first like to talk about two other campaign types that can help you with generating leads on Twitter. If you want to start acquiring leads on Twitter, the first step would be to give your brand’s Twitter profile more exposure and build followers. The Awareness campaign is a great way for new up and coming companies to increase their presence on Twitter. Awareness campaigns start off with the standard features that are used to target certain users in other campaigns. These features include the ability to use Tailored Audiences, or highly filtered profiles that precisely direct your Twitter ad to its most salient audience. All Twitter ad campaigns have a pretty similar setup, so I will move forward with the Awareness campaign as an example. The first step is to customize the name of your campaign and relate it directly to your target audience. You can set the start and end dates for your campaign and also set a per diem so that you do not go over your company budget for the day. The general recommendation is to start with a budget of a minimum of $30/day. Then you need to choose your videos. Twitter suggests adding 4-5 tweets to promote in a campaign. You can select a tweet that has already been posted, and in this case you may want to choose a tweet that has seen many likes and reposts organically, or you can create a new tweet for your ad. If you’d rather create a new tweet, you will be redirected to a tweet composer. 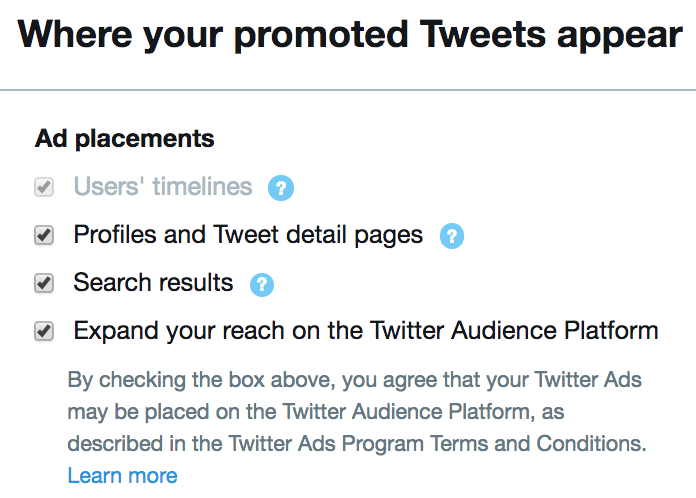 You can also check a “Promoted-only” checkbox to ensure your tweet is only delivered to users targeted in campaigns and not to your followers. If you uncheck the box, your tweet will be delivered to all your followers. When you click on the Camera button “upload a video,” you will be again offered the chance to select from your uploaded videos, or you can go to the Media Studio to add a new one. 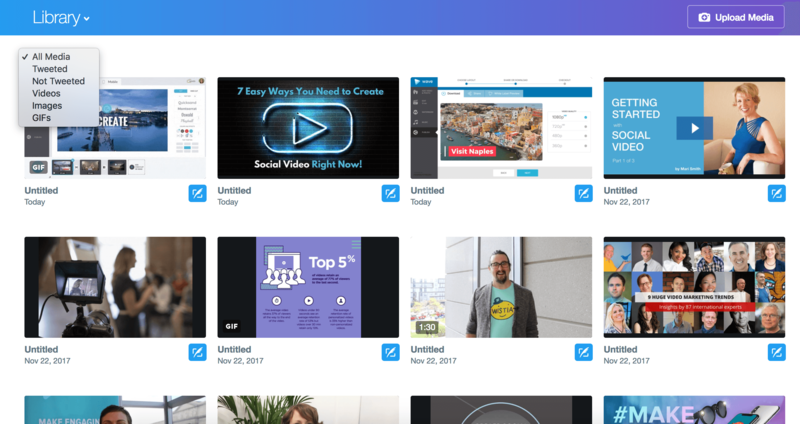 Media Studio is the updated version of video.twitter.com that gives advertisers the ability to access all Twitter video publishing tools in one place. This is exactly where all your creatives are stored. Media Studio has a video tweet planner that gives advertisers the ability to schedule tweets for an automated, ubiquitous online presence. This feature also allows for better collaboration with remote team members. The Studio has new account access controls to let advertisers switch easily among accounts. Media Studio fixes many of the stability issues that plagued video.twitter.com. Upload speed is also much faster. 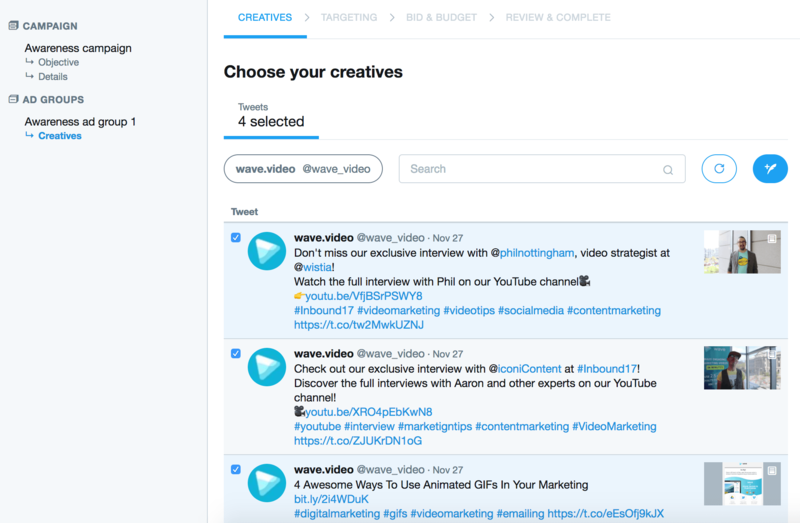 After choosing a video in the tweet composer or uploading one in the Media Studio, you can go back to the creatives selection in the Twitter Ads Manager and move forward with targeting your audience. 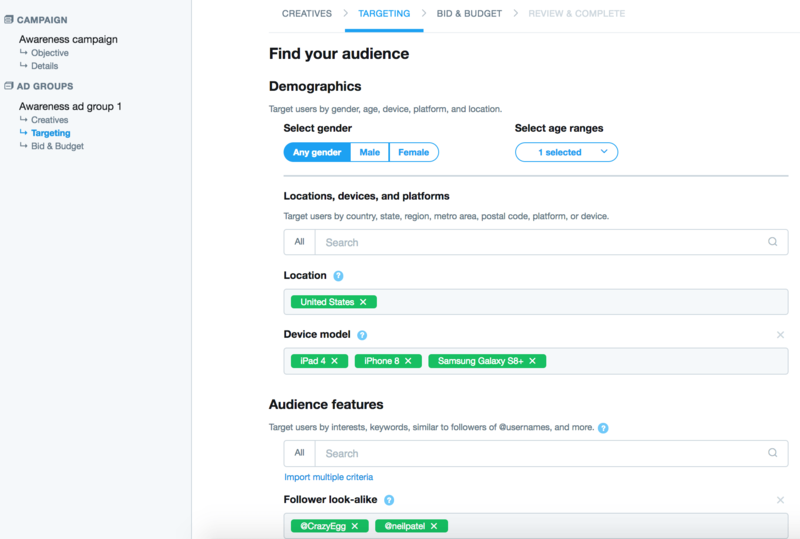 Twitter allows you to filter the audience by gender, language, geographical location, and even the devices that you expect your audience will be using. After that, you move into a bevy of advanced filters including keywords, followers, interests, TV targeting, behaviors, and event targeting. 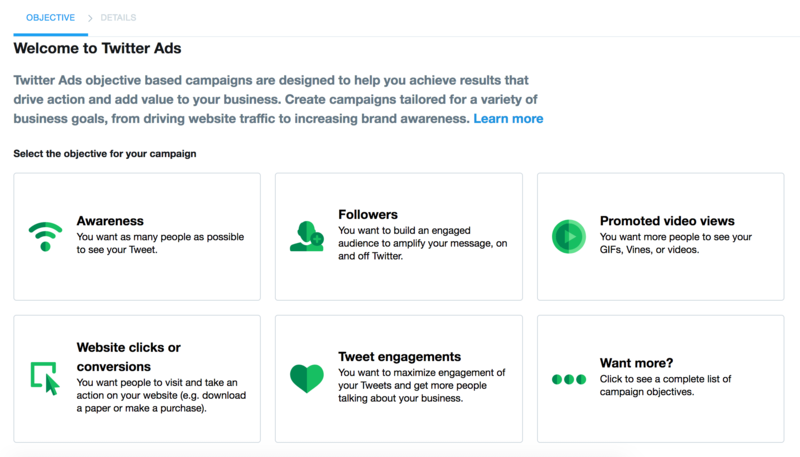 The major difference between an Awareness campaign and other Twitter campaigns is that you pay for every 1,000 impressions rather than paying for actual engagements. Awareness campaigns are a great option if you are just getting started on Twitter. However, a Promoted Video Views campaign has been specifically developed to promote videos and help you capitalize on your video content. In the Twitter Ads Manager, you can select the “Promoted Video Views” option from the “Create new campaign” button and drop-down menu. With this type of an ad campaign, you pay for the number of promoted video views. Twitter considers a chargeable view when it is 50% in-view in the user’s timeline and is watched for at least 2 seconds or when it’s a click to watch in fullscreen/unmute — whichever comes first. 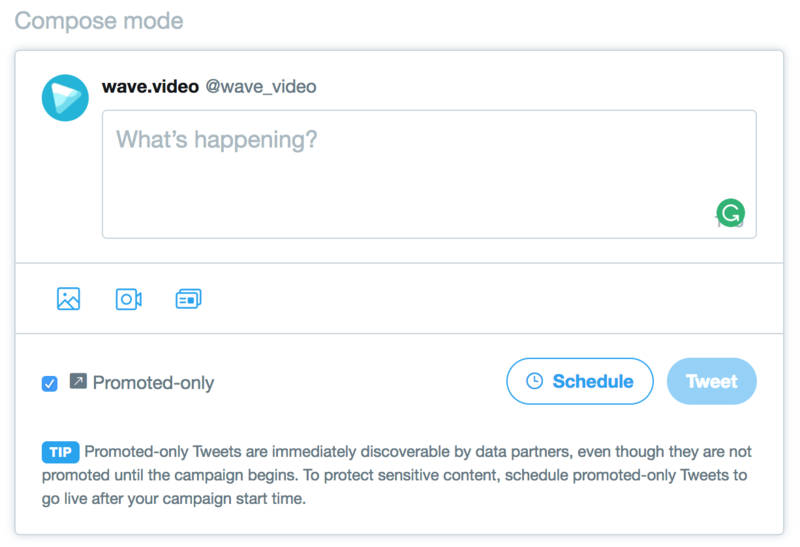 Promoted Videos play automatically as users scroll through their Twitter timelines. The result is a high level of engagement without a hard sell because users will naturally want to interact with the first thing they see moving on their screens. Leads are generated as user interest in the product is increased. Promoted Videos should be short, entertaining, and most of all, looking to solve the immediate problems of the user. Most will last no longer than 30 seconds, and many viral videos last no longer than 15 seconds. This campaign type is optimized to drive traffic to your landing page from tweets targeted to specific audiences of users. It helps feature your content within a tweet in a way that is designed to maximize click-throughs to your website. However, to track your conversions correctly, you will need a website tag (snippet of code used to target promoted content on Twitter to users who have already shown interest in your brand by visiting your website). 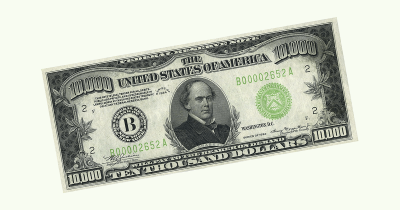 With the Website Clicks or Conversions campaign, you pay for the number of website link clicks. When choosing the creatives during the campaign setup, you will determine where your Promoted Video tweets actually appear. You can make them show up on the timelines of users or on user profiles and tweet detail pages. You can promote them into the Twitter search results as well as place them on the Twitter Audience Platform, a network of thousands of mobile apps and websites outside Twitter. You can manage, track, and edit all your advertising campaigns within the Twitter Ads Manager. You need to have your creatives ready for Twitter to start with video ads. 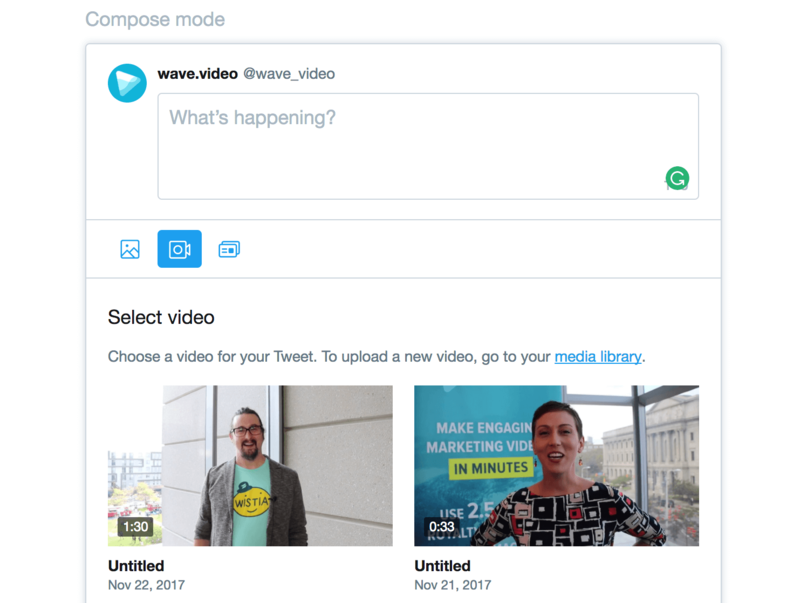 Twitter makes it easy to record and upload videos and GIFs from every major operating system, both desktop and mobile. Here is how you can add videos to create video ads on iOS, Android, and over the Internet. You will see a tweet icon that looks like a feather on your main Twitter screen. Tap it once. Below the box where you compose your tweets, there are a few options that will add a new video or photo to your tweet. The most recent media that you have produced will also appear as thumbnails in this portion of the screen. You can select the pre-recorded videos to tweet from here. If you need to include a GIF, then tap the GIF icon once. Tap the Camera button to record a new video. Then tap the video icon (it looks like an old-school movie camera) and hold down the red camera, which is the “Record” button. Change the order of clips by moving them sideways after recording, or delete part of the video by dragging it up before you tweet it out. iPhone: Tap the “Done” button once you are finished recording. You can preview what you have done by hitting the “Play” button once, which will also take you to a screen to make additional edits. 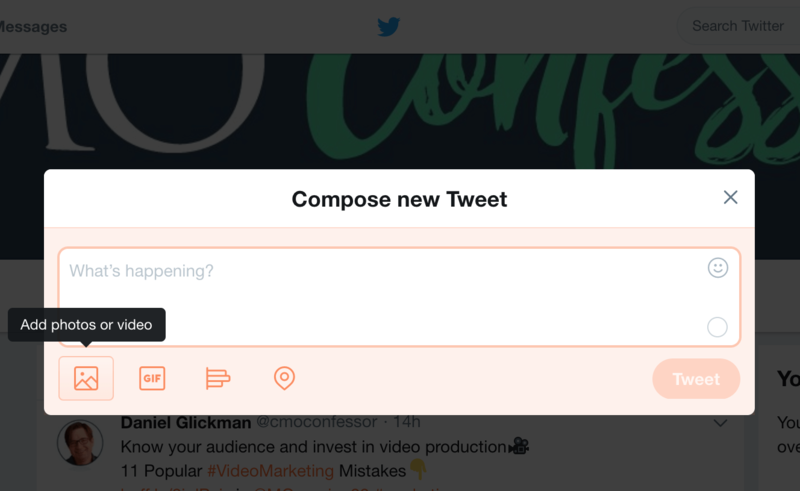 Once you are done editing, simply hit “Tweet” to share your video along with the message or caption that you have typed out. 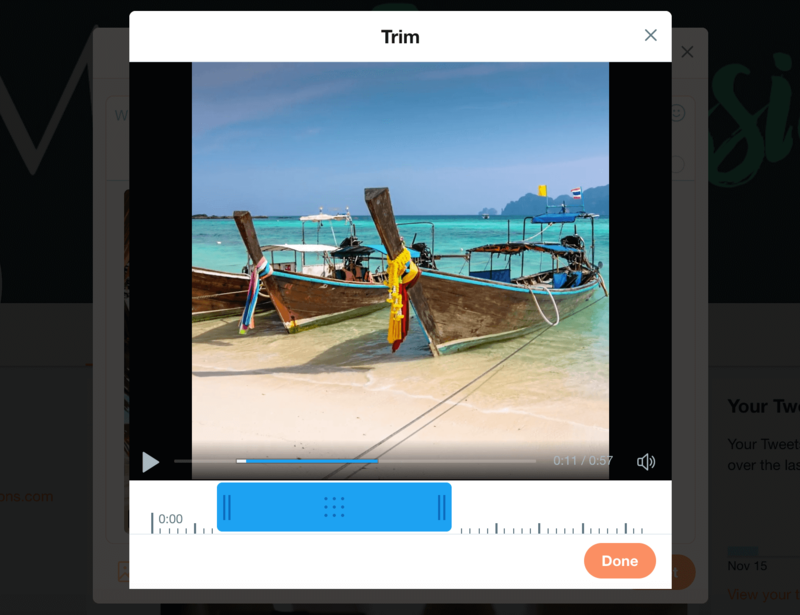 Android: Once you are done editing, you can simply tap the “Tweet” button to share your video and any message or caption that you have typed to coincide with it. Tap the Tweet button in the upper right corner of the screen. In the Compose new Tweet window, select the “Add photos or video” option. Find the video that you want to put out, and tap on it one time to select the video. You may want to trim down the length of the video. You can do this by dragging either side of the bar that appears on the edges of the video. Now that you have properly edited and trimmed your video, you can share it by simply tapping the “Tweet” button. Be sure to add any message that you want before hitting the button. Note: You can record and upload up to 140 seconds of video on any OS. The door is wide open for any kind of video ad on Twitter. However, there are some trends that you cannot ignore as an advertiser if you are looking for viral content or highly sticky content. Here are some of the unwritten rules to optimize your video, regardless of the Twitter distribution features that you use. In general, as I have mentioned, no ad needs to be longer than one minute, with the range of the majority of viral videos between 15 and 45 seconds (see all video examples above). There are ads that can be successful and last longer than one minute, but these are usually not to generate leads during the customer acquisition phase. Longer ads are for people who are already familiar with the brand or for other social media platforms, for example Facebook, where people are used to watching longer videos. Make sure that your video is optimized for the mobile screen, meaning that you should use a square video format. Videos that are not mobile-first may look great on laptops or desktops but look completely horrendous on mobile devices. Considering the statistics above about the amount of viewership that comes from mobile devices on Twitter (over 90%), this is an essential step to consider. In many cases, publishers will use titles, captions, or text overlay to replace sound. This ensures that the message of your video comes through loud and clear no matter what. It also provides an extra location to promote your wares. Placing short, poignant messages in different places around your ad can be a powerful tool for engagement. However, titles are not possible for live videos and are abundant in GIFs. In conclusion, Twitter can be an extremely effective advertising platform when approached correctly. With more than 60% of Twitter users being millennials, video should be your first choice, as it is dynamic and catches the eye instantly. However, great video content rarely creates miracles alone, so don’t forget there are a few other parts of the equation, such as strong ad copy, precise audience targeting, and of course a landing page designed specifically for conversion to get the most out of your advertising campaign. About the Author: Daniel Glickman is the CMO at Animatron, the parent company of an online video maker Wave.video. With over two decades of experience in marketing, sales, and brand promotion, he believes in customer engagement through multi-media and video.